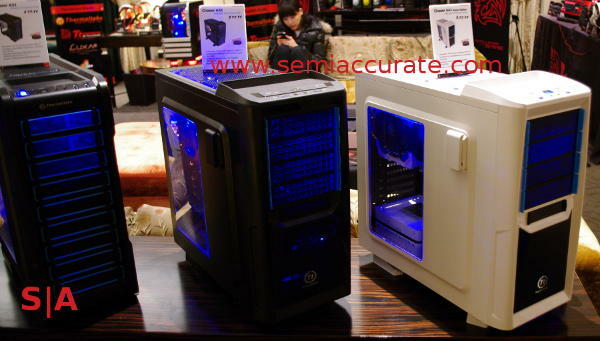 Thermaltake was showing off a new look for their cases at CES, gone is the old ‘not Starcraft’ theme, in it’s place is a much cleaner face. Broad design strokes are one end of the spectrum, useful little goodies are the other, and luckily there were lots of them too. While the old cases were aimed at a particular audience, lets just call them not anyone at SemiAccurate, the new designs are fairly nice. For the most part cases that are complex for a functional reason are OK, but these are few and far between. 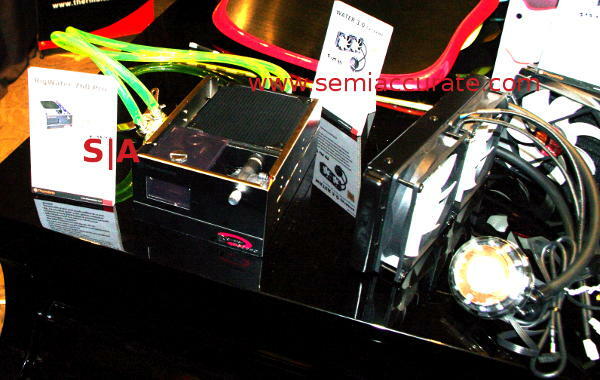 Ones overdone for mere design usually don’t impress us, and that is the direction Thermaltake was headed recently. The new Chaser A31 and A41 series move TT back in the right direction. The new Chaser series is clean, simple, and cheaper than before. All three are around $99 MSRP, with the white variants no longer commanding a slight price premium. This isn’t to say they cut back on anything, the new designs still have a headphone holder on the side and all the other nice touches TT has made standard. I for one am glad they changed direction. From there, the Urban S31 and S41 take the clean look to a new extreme with a completely blank front face and nicely rounded corners. At $89 and $129, they bracket the Chaser series in price but are aimed at a different market. Chaser is the gamer oriented line, Urban is a more office friendly line. The one thing that impressed me about the S41 is the large front door, normally a cheap piece of floppy plastic, this is anything but. It was light, reinforced very well, and had slick magnetic latches that screamed Apple. The early prototype was a bit rough after a week of CES manhandling, but if the production version lives up to this one, it will be a very nice case indeed. We shall see at the next show, but are cautiously optimistic. Moving on to a different topic, we have the long overdue and very welcome comeback of some Thermaltake water cooling products. The BigWater 760 Pro is the classic dual 5.25″ drive bay CPU cooler that the company used to make many of. This updated one has a much wider radiator than before, a variable speed fan, 3/8″ tubing, and a universal CPU mounting kit. If nothing else, what else are you going to use a 5.25″ bay for? The Water 3.0 Extreme is the more common type with two 120mm fans and a 240mm radiator to shed excess heat through. They list for $139 and $129 respectively, but for only $10 more, we would take the BigWater every time. Last up are something far more useful than they seem at first glance, the Max 5 Quad and Max 5 Duet HDD bays. They are essentially converters so you can fit four 2.5″ HDDs or SSDs in to a 5.25″ drive bay for the Quad, two 2.5″ drives in a 3.5″ bay for the Duet. All drives have hot plug quick release brackets for easy replacement, but so does the entire bay. Both Quad and Duet models have handles so you can pull the entire cage out in a hot plug fashion just like individual drives.